Discussion in 'Sager and Clevo' started by HTWingNut, Jun 1, 2012. EDIT: I HAVE NOT UPDATED THIS FIRST THREAD IN A WHILE BUT PLEASE VISIT BIOSMODS.WORDPRESS.COM. THERE IS SUPPORT FOR MOST OF THE CLEVO MODELS THERE INCLUDING GPU MODS INCLUDING THE LATEST 860M. Please find results from the v1.1 Prema Mod using the W230SS with GTX 860m. - should allow users to increase their vRAM clocks which were limited to about +200 to +250MHz (+500MHz effective) by loosening the timings a bit, and should allow for speeds ~ +400MHz or faster (for +800MHz effective for total ~ 5800MHz vRAM). - core voltage can be increased to 1.20V from stock 1.15V. This will allow more stable overclocks and possibly push the top end clocks by 20-50MHz. Note that all machines and video cards are different so results can and will vary wildly between machines. Consider any extra performance you get as a free bonus. It is clear that the result is about 20-25% FPS improvement across the board, and fairly linear. The stock BIOS of the CLEVO W110ER is quite sparse and really doesn't offer the user much in the way of configurability. 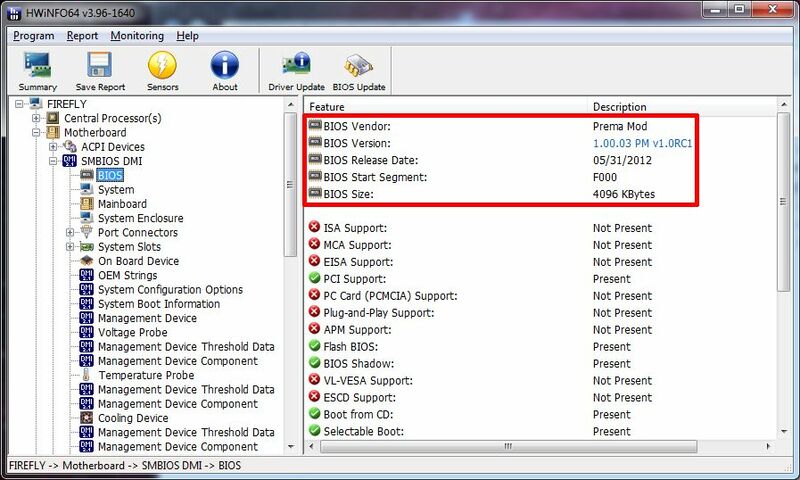 Thankfully NBR user Prema has shared his skillset and delved through they myriad of possible options to develop a BIOS with extra capability. I was fortunate enough to be able to beta test the BIOS and help widdle down the options to the small set of features that Clevo left enabled, although hidden, allowing us power users to configure additional features. Here I will offer a rundown of the features available from this BIOS and will follow up with some benchmarking and testing results that validate the changes, most at a later date, since benching takes a while, I wanted to make sure I offered a quick review of the features before the release of the BIOS just because of the additional time it takes to complete benchmarking and compile it. 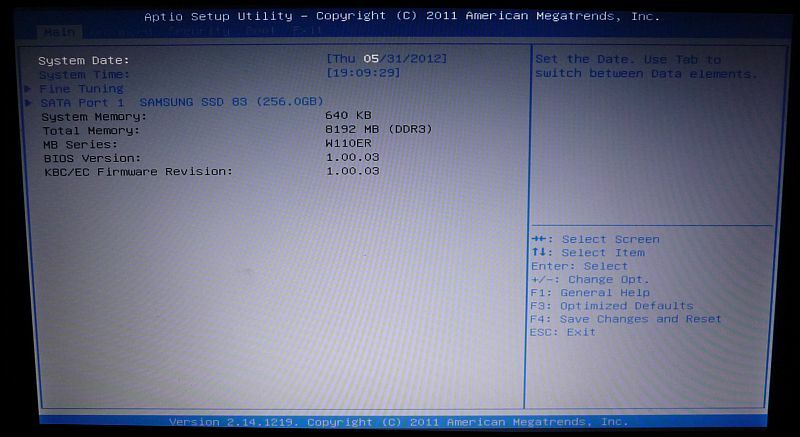 As you can see, HWInfo64 indicates the BIOS version as RC1, which is important to note. There may still be a few bugs to work out, but for the most part I've found the options available do work and are stable. All testing was done on the code/options leading to this RC1 release, which is based on the recently available 1.03 BIOS. The full release should be available shortly after this review is posted. Make sure to keep an eye on biosmods.Wordpress.com. It's currently under construction but will be made available as soon as the final version is complete. This BIOS should be compatible with any Clevo W110ER variant including the Sager NP6110, Malibal Lotus W110ER, and Mythlogic Chaos 1212. Below are screenshots from the main screen you will see as well as details in the new "Fine Tuning" menu present on the main BIOS screen. Features relating to tuning the system are found in the main BIOS screen under the new menu "Fine Tuning". 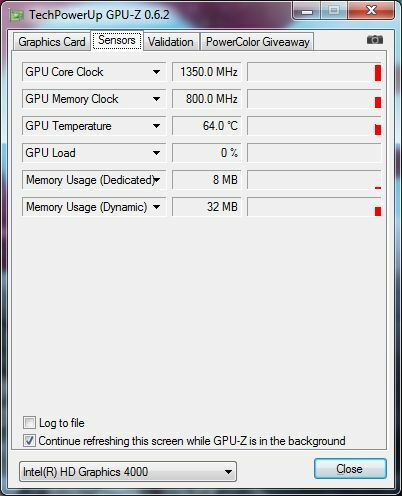 IGP Overclock: Utilizing the GT Overclocking Support and GT Overclocking Frequency, the Ivy Bridge IGP HD 4000 can be overclocked in increments of 50MHz. So far I have successfully been able to clock it at 1350MHz compared to the stock 1100MHz. It will still idle at 650MHz, but at load will reach the BIOS set multiplier speed. Basically take the multiplier x 50MHz to give you max boost speed. 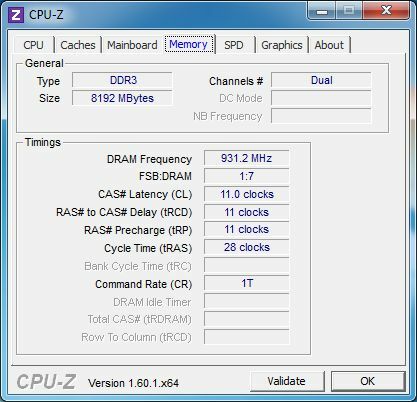 RAM timings and speed: With the "DIMM Profile" option, there is the option to set default RAM configuration which is on by default. Basically it will read the stock JEDEC information. 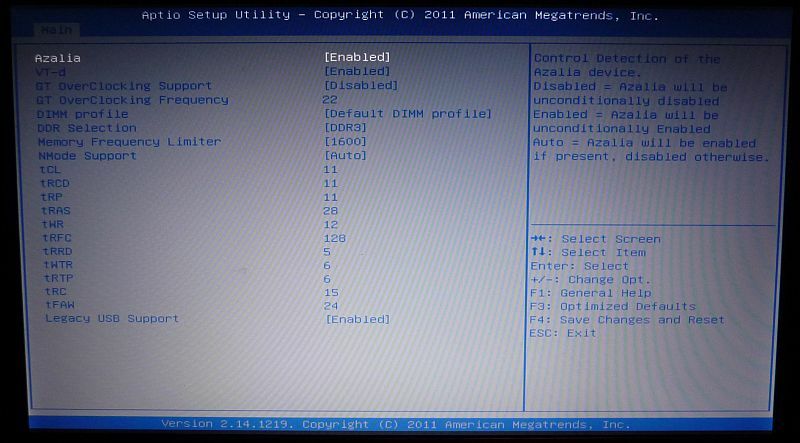 However RAM timings and speed are user configurable if desired by selecting "user configuration". You can then set your timing information from all the options below the "DIMM Profile" selection. This includes DDR3 speed from 1066 up to 2667MHz! 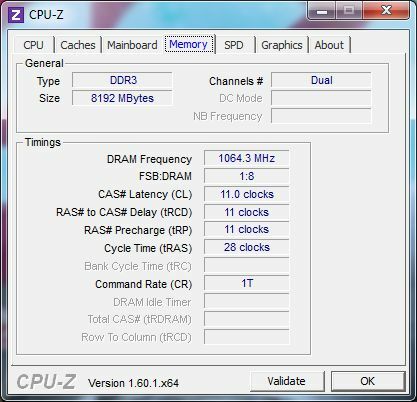 I was able to successfully clock my Samsung 1.35V 2x4GB DDR3 1600 CAS 11 RAM to run at 2133MHz with stock 1600 timings of 11-11-11-1T. There is also an option to select between XMP Profile 1 and XMP Profile 2 if your RAM supports XMP profiles. What can faster RAM do for you? It improves system responsiveness by an amount that is difficult to measure but readily apparent the first time you engage it. It will also allow for improved IGP performance of the HD 4000. - DISABLE BATTERY LOW ALARM BEEP ! Yay! If any of you have taken your battery down to 5%, you will be very happy for the option to disable the battery low beep, it is nothing short of the shrill sound of a fire alarm. 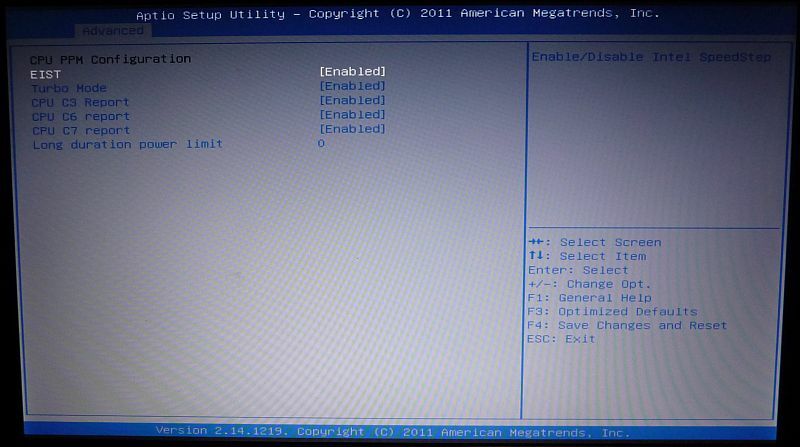 In the menus of importance are CPU Configuration and CPU PPM Configuration. CPU Configuration: Aside from showing detailed information on your CPU, the most important addition here is the ability to enable or disable hyper-threading. My results from this so far have shown little to no improvement in battery life or heat output, but at times it needs to be disabled for compatability reasons. 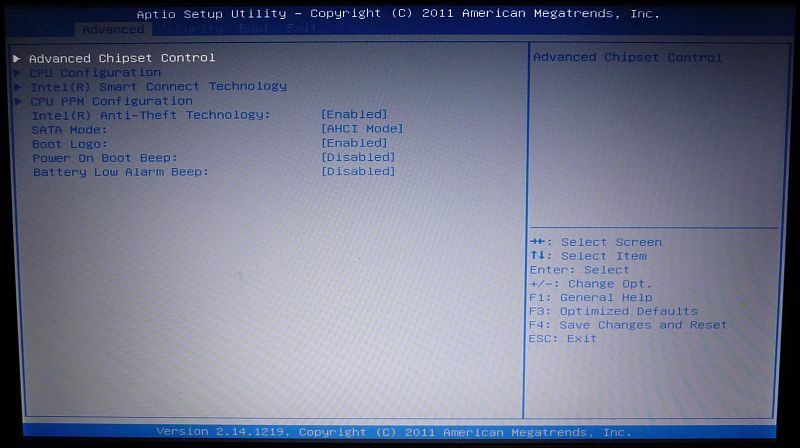 CPU PPM Configuration: There's several important features here to make note of. - EIST: Enable or disable speed step. This has many advantages. For one, allowing the CPU and integrated GPU to run full speed on battery. It should also help maintain faster speeds instead of throttling. - Turbo Mode: Enable or disable turbo mode. For those that want a cool running machine, turning off turbo mode can help, as can getting help with more battery life if you stress your CPU quite a bit while running unplugged. Obviously you will lose performance, but in most cases the peak non-turbo speed is more than adequate. - C3, C6, C7 Report: I don't use these nor do I really understand them but we were able to determine they do activate. Prema may be able to elaborate on their use. - Long duration power limit: This should technically allow for the CPU to run longer periods before throttling. There were a few other options that can work in conjunction with this but are disabled because it's easy to fry your computer unless you know what you're doing! And there you go! Many of you I know were hoping for a few other options, namely CPU core configuration. Unfortunately, while those options were in the BIOS they did not work. So we will have to hope for Clevo or Sager to implement some changes. Everyone should thank Prema for at least making additional features available that weren't available to us previously. The BIOS should be made available soon for your use. Keep an eye out at biosmods.wordpress.com for updates and downloads. Look for benchmark results from RAM overclocks and iGP overclocks in the near future. Also, please as usual, please be careful when overclocking anything as it can cause system damage in rare cases if you're not careful. Best to increase in small increments. Prema also noted that once this is complete he will port it over to the W15 and W17 models and is looking for beta testers for those. So PM him if you're interested in beta testing for the W15 or W17. Let me just say to ask if you are serious because it is a serious time commitment, but can be fun to do. Prema, Cenvan and CyberTronics like this. EDIT: Intel Management Engine Driver updated, too. - Fixed CPU Turbo being disabled while dGPU is active "bug"
- Added a few Advanced Boot options incl. "Fast Boot"
Prema Mod v1 for W230ST released! Prema Mod for W230ST updated to v1.1. Latest stock BIOS & EC for W230ST, P1xxSM & P570WM added. Prema Mod v1 for P15xSM & P17xSM added! Latest stock BIOS & ECs for P370SM, P370SM3, P375SM, P570WM & P570WM3 added. Prema Mod for P570WMx updated to v3. Prema Mod v1.1 for P15xSM & P17xSM added. Prema Mod for P150SM, P151SM, P157SM, P170SM, P177SM, P370SM, P375SM, W230ST, W35xST & W370ST updated to v2! Prema Mod for P570WMx updated to v4 and now on the blog. Cloudfire, LTBonham and teuing like this. Great job Prema and HT, really appreciate it! Love helping people out, and surely you guys do too!! 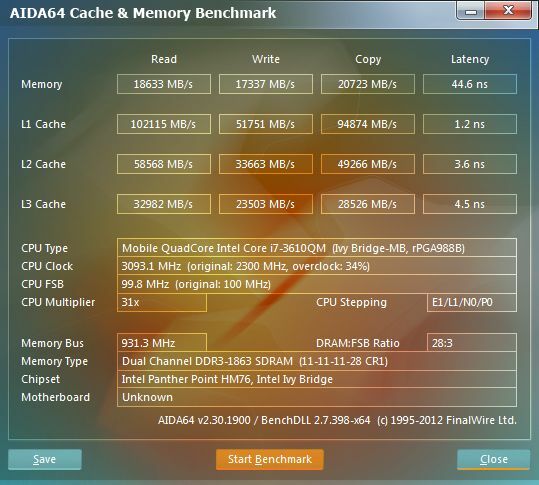 Between the OC and faster RAM the HD4000 should get quite a boost. If you could run some benchmarks on it I'd be grateful, want to see how fast it can go. Also +rep. Is the BIOS unlocked, I mean, do you guys happen to know whether you could tweak things like multiplier with ThrottleStop? Thanks. On Alienware some non-XM IB CPUs allow the multi to be raised by 4 steps. So if future tests show different results the option will return. 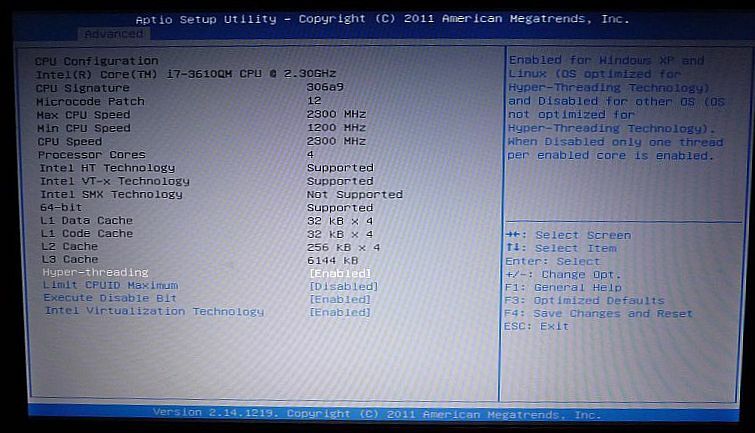 What works in BIOS is raising the TDP to make sure it reaches the full turbo and you guys get what you paid for. deadsmiley and Cloudfire like this. Great job guys, It amazes me at times how dedicated some members of these forums are. I salute you both for undertaking this task, to Prema for spending time and effort on this not to mention the knowledge you need to do this job. To HTW for having the guts to be the guinea pig and sacrificing his machine and time for the greater good. Hi there. Does this mean that it solves the CPU throttling problem while the 650M is active? Can you tell us how to do it when you release the BIOS? The long-term TDP feature allows your CPU to reach advertised Turbo Boost Mhz and (in an ideal scenario) maintain it for longer. The disabled Turbo during enabled GT650M is another issue that I may be able to address in a future release once I have my own W110 and don`t risk bricking other peoples stuff.